10 signs you may be a Blog Addict & a checklist to find out! As you all know, this is a parenting blog, or more appropriately, a place for me to put down my thoughts on this marvelous journey (yeah, right!) called Motherhood, together with its delightful add-ons such as tantrums, life lessons, learning to let go, yelling less and basically surviving on just the bare minimum of sleep daily. So, to carry forward what Tammy says so eloquently, here are more signs that you may be addicted to this wonderful, enriching thing called Blogging. I mean, er.. this time-sucking, draining and insomnia-inducing thing called Blogging! Be advised that I have done NONE of the below and I will defend my stance in a court of law, until my dying breath! Your face lights up when you see an Award nomination for your blog and you just shrug and pat her on the head when your child comes home with a badge for ‘Best-behaved kid at Recess’. You dislike staying up nights to feed your wailing newborn but are more than willing to pull an all-nighter if it means churning out those posts every night. You are more likely to know the number of ‘Likes’ that your Facebook page has than the number of friends your kids make on the playground. You proudly strut the fact that you write a blog (or two or gosh, three!) and try to hide the fact that you don’t know where kid # 3 is or what he’s doing. You sprain a shoulder and snap irritably at kid # 2 for asking you to carry her around all day but doggedly type away with the good hand, even though it takes you thrice as long to finish that post! You feign an illness to get out of a family trip, just so you can blog about the wonderful feeling of peace at home. You flaunt a real badge that says , ‘I am a blogger’ and don’t even realise that people are giving you funny looks when you walk down the street. You get a T-shirt made that asserts, ‘ I blog, therefore I am‘ and wonder why there is a sound of running feet and pitchforks when you step out in public. 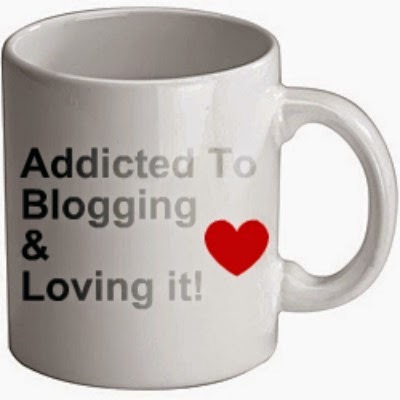 You have a coffee mug that says, I am a Blog Addict and carry it around unashamedly. Score yourself and tell me how you fared! So are you a Blogging Addict or a Devoted Mum? If you’re the former, I empathise. Ok….I”m going to get myself one of those shirts NOW! hahah This was truly funny. I am both to answer your question. I have no answer to why though. 😉 Am using my WP id because blogger is somehow not registering my comment. Uh oh… I'm in trouble but at least I am in good company! Awww, don't worry, my dear. It will pass soon! LOL This was fun to read. While I think I may have been a blog addict, I think that since I have been taking an extended break…and detoxing myself so to speak, I think I have broke out of the addiction for the time being and discovered there is actually more to life! Love it, Shailaja! I had a good chuckle over your post and could definitely relate. So, where can I get one of those tshirts and the mugs? Oh you made me laugh, I'm addicted. I am not willing to admit I am an addict but I’m sure my family has other thoughts! I do resemble #3, however, and haven’t had this problem since late nights in college. I’m not sure I am willing to admit I’m an addict but I’m sure my loved ones have other thoughts! I do resemble #3 for sure, haven’t had this problem since college! Well, I’m tipping at 7 already & perhaps can’t live without blogging. HAhaha..just stumbled across this post and can proudly rate myself a 10/10! I, too, have become a blog-addict, Shy! All I do these days is think of ways to write posts, share on various social media platforms, ways to make attractive images, and words to use to make my post awesome! Tee-hee!